Were Key Survivors from Estonia Catastrophe Kidnapped? Where is Captain Avo Piht and other missing Estonia crew members? The recent revelations of "enforced disappearances" of two Egyptian "terror suspects" carried out in Sweden in 2001 may shed light on the fate of nine missing survivors from the Estonia catastrophe of 1994. Last week, in an article entitled "Ghost Planes" Make Suspects Disappear, I reported that a U.S. registered Gulfstream 5 executive jet played a role in the "extraordinary rendition" or “enforced disappearance” of two Egyptian "terror suspects" from Sweden in 2001. As reported, there is evidence that a similar abduction may have occurred in Sweden in the days following the Estonia ferry disaster of late September 1994. According to Swedish journalist Sven Anér, enforced disappearances from Sweden are nothing new. More than 10 years ago, on Sept. 28, 1994, nine Estonian crewmembers, who evidently survived the Estonia ferry disaster, disappeared without a trace. Documents pertaining to the 1994 and 2001 disappearances from Sweden point to U.S. registered private jets being used in both cases. Anér has provided AFP with airport documents concerning the aircraft suspected of being involved in the abduction of the nine missing Estonians. Enforced disappearance, according to the Rome Statute of 1998, "means the arrest, detention or abduction of persons by, or with the authorization, support or acquiescence of, a State or a political organization, followed by a refusal to acknowledge that deprivation of freedom or to give information on the fate or whereabouts of those persons, with the intention of removing them from the protection of the law for a prolonged period of time." Enforced disappearance, a form of kidnapping, is considered a "crime against humanity," according to the Rome Statute, which Sweden ratified in June 2001. Ten years ago, in the immediate aftermath of the Estonia ferry disaster, which took the lives of some 852 people on Sept. 28, 1994, at least nine Estonian crew members, which official survivor lists show having survived the sinking, later mysteriously disappeared in what appears to be a government-organized abduction and enforced disappearance. While the original survivor lists contain the names of 146 individuals, shortly thereafter the names of 11 crew members, who had been listed as survivors, were deleted without explanation from the lists maintained by the Swedish and Finnish authorities. Anér has found 15 different original lists of survivors, all of which include the names of 11 Estonian crew members whose names were later deleted. It should be noted that in order for a name to appear on the list, a survivor was required to give his name, date of birth, status and nationality. There is substantial evidence that at least 9 crewmembers survived the sinking of Estonia and were later abducted and taken to Arlanda airport near Stockholm whence they were flown out of Sweden on two private aircraft. The abduction of these 9 crew members effectively removed key witnesses who would have been able to testify about the condition of the ship and the cause of the sinking. Chief among these were one of the ship's captains, Avo Piht, who was on-board but not on duty that night, and Chief Engineer Lembit Leiger. It is thought that the other seven were crewmembers who had shared the same life raft or been rescued with Piht and Leiger in the same helicopter, Y-64. In the first days after the sinking, it was widely reported that Avo Piht had survived. 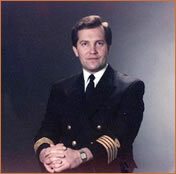 The Swedish television news program Aktuellt, for example, in the evening of Sept. 28, 1994, reported that Ronald Bergman, director of Nordström & Thulin, the Swedish firm that co-owned the vessel with the Estonian state, had called and informed them that the ship's captain had survived and was being treated in a hospital in Finland. Bengt-Erik Stenmark, security chief at the Swedish Maritime Administration told Reuters that the international investigation committee had interviewed Captain Avo Piht. Neither Stenmark nor Reuters has ever retracted this statement. The German television network ZDF showed a video clip on September 28 of Avo Piht and other survivors arriving at Turku University Hospital in Finland. This video was later confiscated by German intelligence agents, according to Estonia researcher Jutta Rabe. Leiger's wife, Kairi, received a call from a relative in Sweden who told her that a Swedish police superintendent named H. Strindlund had called to inform them that her husband had survived. Lembit Leiger had reportedly been treated in Stockholm's Huddinge Hospital and been released on September 29, 24 hours after having been admitted. The next day, Mrs. Leiger spoke to Strindlund herself. Strindlund informed her of the flight details for the plane on which Leiger would be returning to Tallinn – but he never came home. Along with Piht and Leiger, there are at least seven other "disappeared" crew members, whose names remained on survivor lists for days: The ship's doctor, Dr. Viktor Bogdanov, Kalev Vahtras, Kaimar Kikas, Agur Targama, Tiina Müür, and the twin sisters, Hannely and Hanka-Hannika Veide. In Tallinn, at noon on Sept. 28, 1994, the names of survivors provided by the Estonian Department of Transportation were read over the radio. Kalev Vahtras, the ship's quartermaster, was one of them. Silver Linde, a surviving seaman, told Jutta Rabe that he had shared a hospital room in Turku, Finland, with Vahtras. Vahtras and Linde were friends and the two spoke in the hospital. Vahtras had no noticeable injuries, although his body temperature was low and he was wrapped in blankets, Linde said. Linde went to visit other survivors and left Kalev alone in the room. When Linde returned with another crewmember, they discovered that Vahtras was gone. His entire bed had vanished. Linde asked a nurse about Vahtras and was told he had been transferred to another hospital. A survivor list from Turku hospital shows Vahtras' name and body temperature. Vahtras' wife went to Turku and was told her husband was in a hospital in Sweden. Eventually an unrecognizable and disfigured corpse said to be Vahtras was returned to Estonia with a death certificate which read: Drowned in the Baltic Sea. Linde is serving a 9-year prison sentence in Finland, the victim of a framed charge of drug trafficking. Aftonbladet, the Swedish daily, reported on the day of the sinking that rescue worker Kenneth Svensson, on a rescue trip with Swedish Navy helicopter Y-64, rescued 9 people at about 3 a.m. on Sept. 28. Half an hour later, according to Aftonbladet, the helicopter took the rescued to Huddinge Hospital in Stockholm, arriving at 4:30 a.m., with nine persons, one of whom was dead. There is, however, no information as to who these 9 people were. The early rescue by Kenneth Svensson, however, was completely censored from the final report (JAIC), published three years later. According to the final report, Y-64 only rescued one person at 5:10 a.m. Svensson received a medal for heroic service from Sweden's supreme commander Owe Victorin and was requested not to discuss the matter. As AFP reported earlier, it was Owe Victorin who authorized the smuggling of Soviet weapons technology on Estonia in the first place. There was an agreement between Victorin and the commissioner of customs, Ulf Larsson, for a specific senior customs officer to clear the contraband materials, without any inspection, on arrival in Stockholm. At least two shipments of Soviet weapons technology had been delivered on Estonia under this arrangement in September 1994. Jan Lindqvist, information chief for Sweden's civil aviation administration, provided Anér with documentation of two private planes that left Stockholm's Arlanda airport carrying a total of 9 unregistered passengers on the 28th and 29th of September. The first plane, a Boeing 727-200, then registered VR-CLM, belonged to Larmag Aviation Cayman Ltd., a Bermuda-based company owned by Lars-Erik Magnusson, a Swedish casino owner and real estate mogul who became invested heavily in an oil and gas scheme in Turkmenistan in 1994 with funds taken from another firm, Fermenta. The 161-seat Larmag 727 arrived from Amsterdam on the evening of Sept. 27 without passengers or cargo and left at 8:54 p.m. on Sept. 28 with 4 unregistered passengers headed for Amsterdam. The second plane, a Gulfstream 4, registered N971L, belongs to International Lease Finance Corp. (ILFC) of Los Angeles, California. 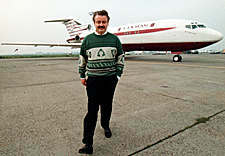 ILFC, an aircraft leasing company, was founded by Leslie Gonda, born Lazlo Goldschmied in Hungary. Today, Maurice R. Greenberg's American International Group (AIG) owns ILFC and Greenberg sits on the board of directors with Gonda. The ILFC Gulfstream arrived at about 11 p.m. on the 28th without passengers from Amsterdam and left at 5:13 on the 29th with 5 unregistered passengers bound for Bangor, Maine. AFP inquired at ILFC about who was operating the plane at the time. April Rotondi wrote that "no one" at ILFC can help with this request and hung up when asked on the phone. Anér told AFP that there was an understanding at Arlanda that invoices for the ILFC Gulfstream were sent to the U.S. Embassy in Stockholm. In his book Mayday, about the Estonia catastrophe, Anér says, "I am convinced that both these ghost planes are connected to the Estonia catastrophe." AFP asked Lindqvist about Anér's information. "I trust the information I gave Sven Anér," Lindqvist said. Asked about the "Kalla Fakta" exposé that a Gulfstream 5, registered to phony front companies in the U.S., was involved in the "enforced disappearance" of two Egyptians in 2001, Lindqvist said: "Through my internal sources, I know that everything in the program is correct." This list shows that Avo Piht, Kalev Vahtras, Hannely (Anne) and Hanka-Hannika Veide were picked up by Swedish Navy helicopter Y-64 from life raft X1 at about 3:30 a.m. (Sept. 28, 1994) and taken to Huddinge Hospital in Stockholm at 4:40 a.m. This is the rescue done by Kenneth Svensson. It should be noted that Hannely is listed with her nickname "Anne," which only she (or her sister) would have known and been able to provide. This list also shows that Kaimar Kikas, Merit Kikas, Tiit Meos, Agur Targama, and Ago Tomingas, from life raft X2, were also picked up by helicopter Y-64 and Kenneth Svensson at about 3:50 a.m. These nine rescued people were taken together to Huddinge Hospital, arriving at 4:40 a.m. on September 28, 1994. These people were seen, registered and spoken to by others including other crew members and hospital personnel. In Captain Avo Piht's case, he was even filmed and interviewed. Interpol, Europe's international police force, initiated a search for Avo Piht after Estonia sank. Police don't search for dead men. The relatives of these survivors were notified of their status and locations. By the next day, September 29, 1994, all of these Estonians had disappeared although their names remained on some lists for more than one week. The dozen missing Estonia crew members is one of the earliest and most egregious examples of "enforced disappearance." Who kidnapped Captain Avo Piht and where is he? Does Lars Magnusson know where his plane was on 27 september 1994? Bollyn Article - "Ghost Planes Make Suspects Disappear"